Shapeabilities Words Etched Dies On the Wings of Love Collection by Joanne Fink is a set of three dies includes the words: Create, Celebrate and Thanks. Great expressions to use on your projects for any occasion. On the Wings of Love Collection brings together faith and art together for a great collaboration created by Joanne Fink. 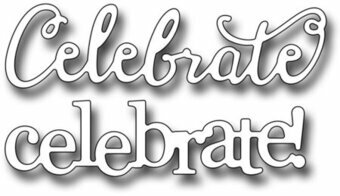 Approximate Size: Celebrate: 4.10 x 1.25 in. 10.40 x 3.20 cm, Create: 3.15 x 1.15 in. 8.00 x 2.90 cm, Thanks: 4.20 x 1.35 in. 10.70 x 3.40 cm. 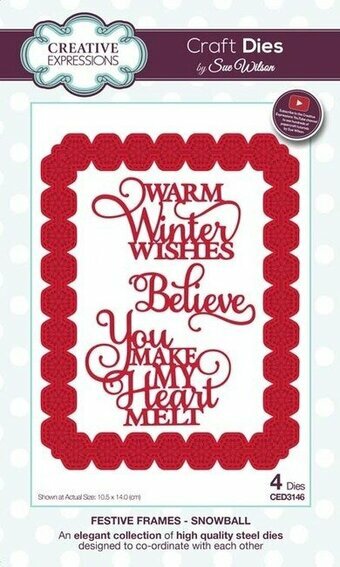 This set of sentiments will come in handy no matter what season! Perfect for making cards for friends. Includes 11 dies. Size Largest: 3.54 x 0.87 inches, Smallest: 0.39 x 0.39 inches. Sweet, Delish and Yummy, are the three word dies you will find in this die set. They are a perfect addition to any food related project.... or just to tell someone how sweet they are. The word "sweet" measures 2" x 1". The word "delish" measures 2.25" x 0.875". The word "yummy" measures 2.25" x 1". Our Frantic Stamper Precision Dies work in most consumer table top die cutting machines such as the Press Boss, Cuttlebug, Big Shot, vagabond, Boss Cut, and Grand Calibur. 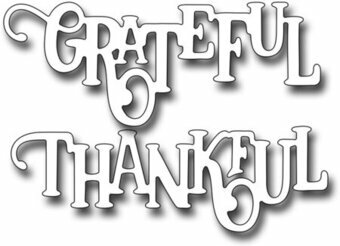 Thanksgiving is all about being thankful. 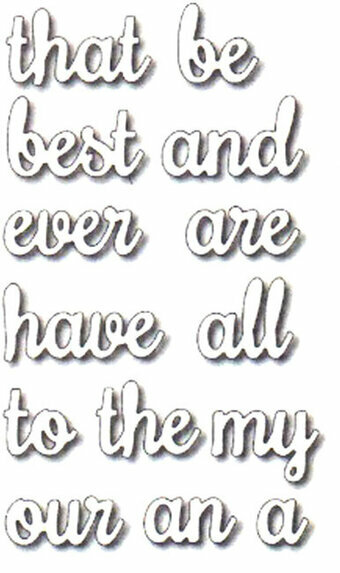 Express this sentiment with this 2.8" wide x 1.125" tall word die. This is a single die measuring 1 x 3-1/2 inches. Features the sentiment "Thoughts". These dies are compatible with most tabletop die cut machines. Impression Obsession die featuring the word "Yeah". This die measures 1 x 1-1/4 inches. These are US-made steel dies compatible with most table-top die cutting machines. Frantic Stamper Precision Die - Accessory words. 14 piece die. A versatile set of Accessory Words will allow you to create all kinds of phrases by mixing and matching them with other word dies. The set includes the following words: be, that, best, are, my, ever, all, and, have, the, a, an, to, and our. Combined with other word dies, you can make custom sentiments fit for any occasion. Approx sizes: 0.5" to 1.5" x 0.75" high. "Celebrate" "Make a Wish" "Birthday Wishes" This is a set of 3 dies. 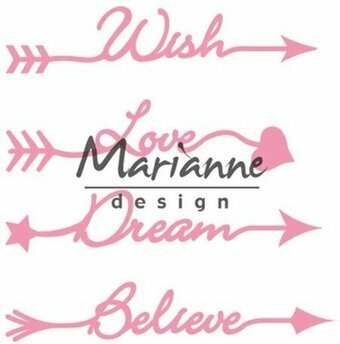 The letters measure between 3/8 inch and 1/2 inch tall and Birthday Wishes is 3-1/8 wide, Make a Wish is 3 inches wide, and Celebrate is 2-1/2 inches wide. Compatible with most table-top die cutting machines. This stencil is a pop-art style featuring the word "boom". Great for graphic style projects or for comic lovers. Includes 1 stencil. Size: 6 x 6 inches. Card makers can enjoy their craft with an embossing folder that simplifies the process! Our "You Are Invited" embossing folder is a papercrafting favorite that will never go out of style thanks to its timeless message. 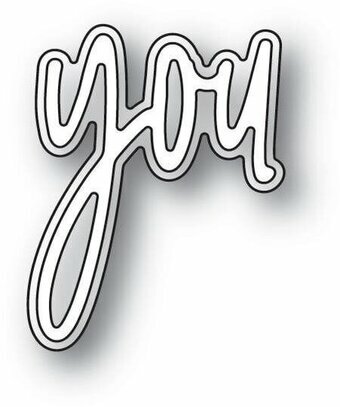 You Are Invited embossing folder. Script font. Horizontal orientation. Works best with heavyweight cardstock. Fits most embossing machines. Embossing folder measures 4.25 x 5.75 inches. 1 word embossing folder per package. This Die-namics will quickly become as essential addition to your collection. It's perfect for housing the sentiments included in the All Smiles stamp set but equally effective for a wide assortment of sentiments included in other sets as well - don't be surprised if it finds a permanent home on your work surface! This 2 piece set includes strips measuring: 3 7/8" x 5/8", 3 7/8" x 3/8". MFT Die-namics dies are our very own EXCLUSIVE, American made line of steel dies. 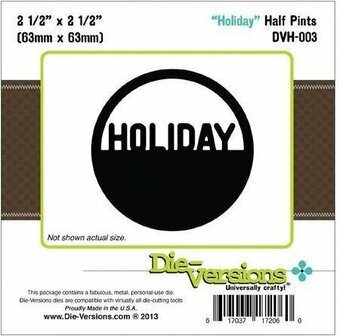 Die-Versions die featuring the sentiment "Holiday". Die-Versions are thin, chemically-etched dies, made in the USA. They are compatible with most die-cutting systems like Sizzix, Spellbinders, Cuttlebug and Quickutz. They are designed to cut cardstock, vinyl, vellum, foam, thin chipboard, cork, metallic paper, felt and more. Each die comes with a piece of ejection foam. Craft die featuring the sentiment "Boys rule through play". 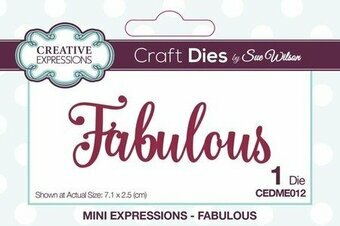 Quickly and easily die-cut shapes from patterned paper, cardstock and other thin materials! Echo Park Designer dies are a cut above the rest. Compatible with most manual die-cut machines.